VIP program offers high returns. Network seems to be moving in wrong direction. Monthly grade for U.S. based rooms from our monthly payment processing report which subjectively grades how quickly poker rooms are paying players on a monthly basis. William Hill is not available to US players. Available in most countries worldwide. William Hill is best known as a bricks-and-mortar betting shop. Its roots are in the UK, but the company has since expanded into the US. Nevada welcomed William Hill as its newest operator after it acquired American Wagering. William Hill also operates the Delaware NFL parlay lottery. William Hill’s poker site does not accept players from the US. It is a member of the iPoker Network. Is William Hill Poker Safe? Third largest U.S. facing poker room with growing traffic. Excellent and consistent payment processing. 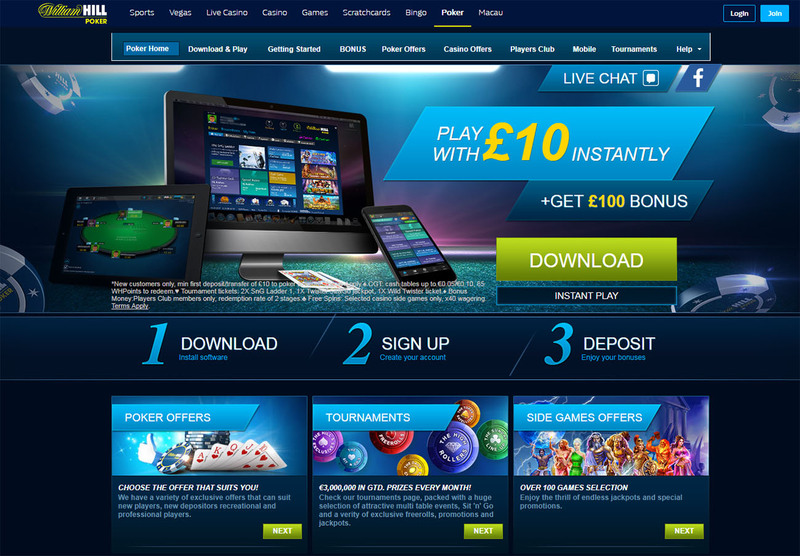 William Hill branched out into online gaming more than a decade ago. William Hill’s online poker operations launched as a member of the Cryptologic Network. As conditions on that network deteriorated, William Hill moved to iPoker. It was on the iPoker2 platform before the design that rewarded high volume skins was disbanded. William Hill offers new poker players a 100% up to €100 first deposit bonus. This offer also includes €10 worth of tournament tickets. William Hill was founded in 1934 and is synonymous with bookmaking in the United Kingdom. There is never a concern about the company’s ability to pay or honor its promotions. The traffic on iPoker is on a level that should satisfy most players. William Hill’s first deposit bonus is small and its VIP program returns little to low volume players. The site has been known to back off winners from its sportsbook. Player support is below average. “Omfg how tilting is the support! William Hill offers fast payments to players. This is because it is licensed in most jurisdictions that it operates. This allows for the use of major ewallets and access to the banking system. William Hill accepts Visa, Mastercard, Maestro, Paypal, Neteller, Ukash, PaySafeCard, Skrill, ClickandBuy and cash deposits at brick and mortar William Hill locations for deposit. Local debit card options are also available. Players may withdraw by Neteller, Skrill, Paypal, Ukash, PaySafeCard, ClickandBuy and cash at any brick and mortar William Hill location. Local debit cards are also available in some countries. The poker site at William Hill always pays players. The company has been known to hassle winning players. This is our only concern. William Hill has always paid players before backing them off so the worst thing that will happen is getting banned after getting all money off the site. William Hill is completely safe in terms of payouts and stability. William Hill offers a small first deposit bonus and many promotions to active players. These include freerolls, free tournament tickets and cash. William Hill offers new player a 100% up to €100 first deposit bonus. New depositors also receive a €3 and €7 tournament tickets. Players get to spin a slot machine 10 times as well. Players have 45 days to clear the bonus. The bonus releases at a rate of €5 for every 250 William Hill points earned. Players earn 25 William Hill Points for every $1 in rake paid. The contributed method is used to determine rake attributed to a player. This means that the amount of rake credited is in direct relation to the amount a player contributes to the pot. Players also earn 25 William Hill Points for every $1 in fees paid when buying into sit and gos and multi table tournaments. William Hill Poker offers a VIP program that is available to all players regardless of volume. There are ten tiers. Points are multiplied starting with the second level, which requires $20 in monthly rake. There are also weekly freerolls of $250, $500 and $1000 available to players depending on their tier. Most of the poker games at William Hill are No Limit Texas Hold’em. The limits start at 0.01/0.02 and run up to 5/10 blinds. Each limit offers a high number of tables during peak hours. Pot Limit Omaha, Pot Limit Omaha Hi/Lo and Fixed Limit Hold’em are all available. All games have the same limits. There is a reasonable level of action at Pot Limit Omaha. There is some low limit action at Pot Limit Omaha Hi/Lo. There are very few active Fixed Limit Hold’em tables. Items in red bold represent limits that have games running. Limits are in $USD. Has There Ever Been a Scandal at William Hill? William Hill has never been involved in any online poker scandals. It pays all players. The only problems are related to a few players that get backed off for winning too much. This applies more to the sportsbook side of the business. What poker network is William Hill on? 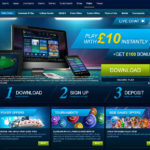 William Hill is on the iPoker Network. Is William Hill on the iPoker2 platform? iPoker no longer splits its network traffic so iPoker1 and iPoker2 no longer exist. What is the William Hill first deposit bonus? New players receive a 100% up to €100 first deposit bonus. Can I get the William Hill deposit bonus in different currencies? The William Hill bonus is available in GBP, Euros and US Dollars.